Monday morning following the Virginia Wine Country Half-Marathon weekend, I checked my email to see a message from the folks at Corrigan Sports announcing packet pickup locations for the Baltimore 10-Miler. If you read my last race recap, you know that I’m about two threads from total rope frayage when it comes to racing. I was looking forward to a week in between this, my final race of the 2015 spring racing season. How nice of them to give us runners two whole weeks to pick up our race packets, I thought nonchalantly. It turns out that wasn’t the case: somehow I was mistaken that the race was on June 14th when it turns out it was on June 6th instead. This coming weekend. Whoops. Luckily, I had nothing much to do this weekend except run 6-8 miles and lay out by the pool (provided if the weather improved), and Baltimore is a close enough drive from DC that I didn’t have to worry too much about rearranging my schedule or booking last minute travel. The problem was that my 10-mile record was now over 3 years old and I really wanted to beat it with this race. It’s not outside the scope of possibility, and I think it’s definitely feasible, but would I be able to do that after having just run a half-marathon the week before? I was ready to find out. The strange thing about this race is that there was no expo. Instead, packet pick-up took place at several Sports Authority locations in the Baltimore-Washington metropolitan area. That latter part was a white lie: the closest location to DC was the Sports Authority in Rockville, Maryland, located just on the outskirts of the city. Hours of packet pick-up for this location were from 12-7 on a Tuesday. For me, this only provided a small window of time after work to take the Metro all the way up to the White Flint Metro station (24 minutes from Farragut North) and walk half a mile in the rain along a busy stretch of road and over a highway overpass. Plus, I was not familiar with this area at all. The entire errand took me over two hours, including train time home. If I had gone home and then driven to Rockville, I might have missed pick-up completely due to rush hour traffic. Leaving in the middle of my work day was not an option either. If I could make one recommendation to Corrigan Sports, it would be to have a DC-based packet pick-up location to better accomodate runners from DC and Virginia. Races in the D-M-V get a lot of runners from all over, and this was just not an easy option. The race does allow race day pickup, but only for the first 200 runners, and you had to have seen the post on social media to sign up. Lucky I had the time on Tuesday to go; otherwise, I’d have had to drive to Laurel, Towson, Baltimore, or Catonville over an hour one way and really rearrange my schedule to do so. Usually with a packet pick-up, you get the race T-shirt. Not the case this time. 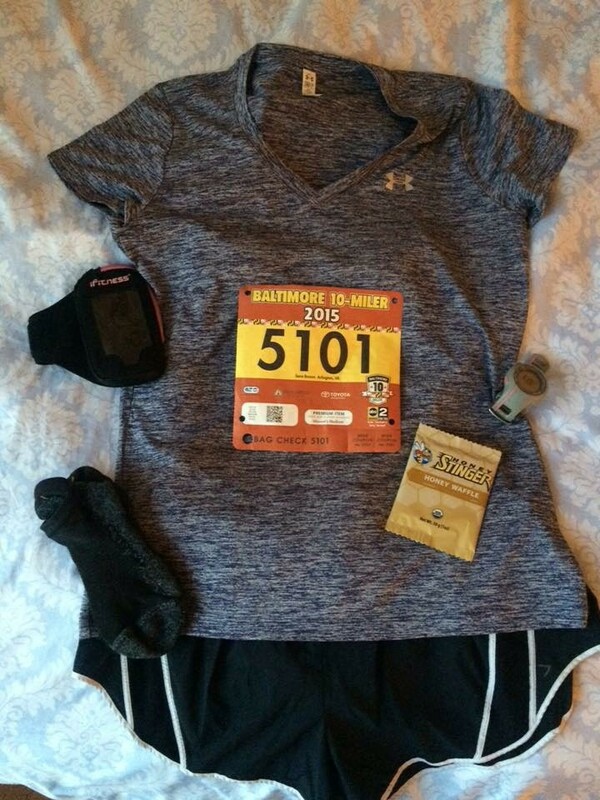 The Baltimore 10-Miler instead chooses a race “premium” that apparantly has gained some noteriety for its awesomeness. This year’s premium, which was handed out after the race, is a red heathered quarter-zip jacket by Born Fit. Running jackets are my kryptonite, so to say I was excited about this would be an understatement. The premium was pretty sweet, if you ask me. Also, the course starts at The Maryland Zoo at Baltimore, but it doesn’t actually go through it. I’m a total sucker for the zoo. I love seeing zoo animals on the course at races, and the Baltimore Marathon has been known to provide runners with support from the animal kingdom along its course. Speaking of which, I was also looking forward to a preview of the Baltimore Marathon. 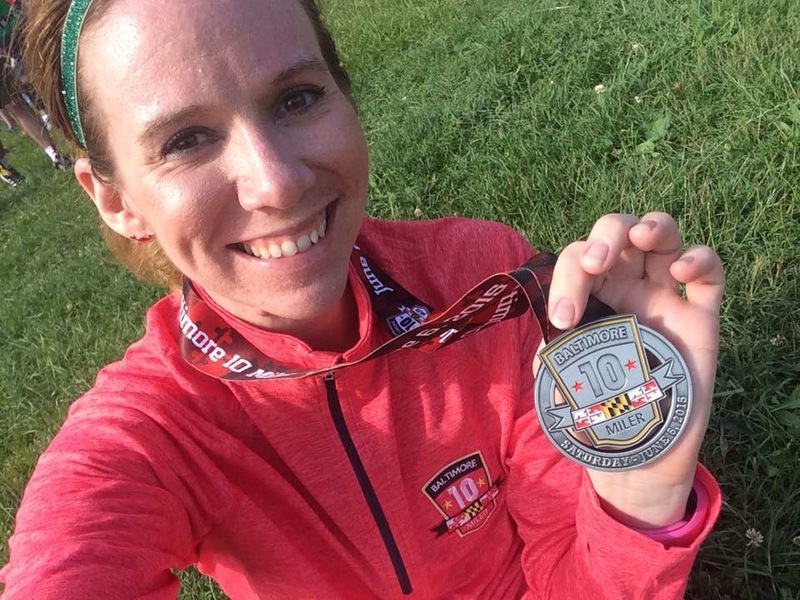 Part of the Baltimore 10-Miler runs the same course as the marathon, so having something in mind while I trained this summer was definitely something that got me pumped for the race. Not to mention watermelon at the finish line. What a perfect way to end a race! I actually hoped race morning would be hot so as to enjoy the full experience of cooling from a hot race with ice cold watermelon. What didn’t get me thrilled about the race was the challenging, hilly course that lay ahead of me. I learned the hard way this year that really understanding the course elevation before a race is critical. I didn’t really look at it for the Frederick Running Festival and I certainly didn’t view it ahead of the Virginia Wine Country Half-Marathon (though it was never quite an obvious discovery). I looked at the course this time, read some reviews, and saw that yes– some hills were to be expected. Prior to going into the race, I hoped that knowing what was coming up would help me channel some of the frustration I felt in my last race and turn it into something good. My primary goal time for the course, ahead of beating my old PR of 1:39, was to run a 1:30 for a 9:00 pace or, secondarily, a 1:35 for a 9:30 pace. 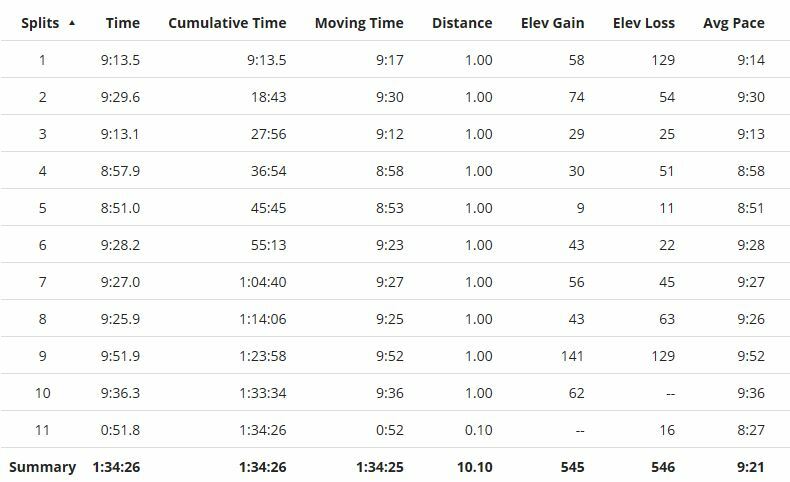 Even if I treated this run as a long run for marathon training, my tertiary goal pace of a minimum 9:36 would still get me a 10-miler PR. Mostly, I just wanted to finish my spring racing season with a PR. I woke up at 5AM with the goal to leave Arlington by 5:30. With an hour’s drive ahead of me, I would get there by 6:30 and have plenty of time for parking and race prep for a 7:30AM start time. I didn’t actually leave, though, until almost 6AM. I could not get myself together on race morning. I had packed my supplies in a bag, set out my clothes, had pre-filled water bottles ready to grab and go. But I second-guessed everything: I needed a long-sleeved shirt to wear for the ride back… maybe I need a running jacket, too… but which one should I take… I ought to take my Stick so I can do a last-minute roll… should I use a water bottle on the course… it’s just 10 miles; I don’t need Gu… maybe I should drink Nuun instead… or Cocogo… don’t forget the Run Baltimore crab– great photo op… sunglasses, check… do I have my actual glasses for driving? I walked all the way down to my car, searching my very jam-packed, overpacked tote bag for my car keys. They were upstairs still. I literally had to sprint across the parking lot and back upstairs. When I left, I was scheduled to arrive shortly before 7AM, which is still enough time, but as I learned the hard way a few weeks ago when I missed a 4PM sail from Annapolis Harbor because of traffic (even when I left at 2:15 for an hour’s drive), DC-Maryland-Virginia traffic is really unpredictable, not to mention I had literally no idea where I was going and the race (God love them) gave a ton of driving directions and parking scenarios, all of which just confused the heck out of me. Yes, of course, races clock you by the time at which you start the race, but a whole host of scenarios were possible when hundreds of people were trying to be in the same stretch of land at the exact same time. Fortunuately, the Baltimore-Washington parkway was relatively light and my GPS, though I don’t know how, somehow got me where I needed to be. Traffic getting into the Maryland Zoo and Druid Hill Park was heavy, just as the race had predicted. I wasn’t actually parked until about 7:10, even though I arrived at 6:45. I don’t even know if I took any of the suggested routes. I just got in line with tons of other cars winding through a park and somehow ended up in a field grid of other cars at the direction of a volunteer. I got ready to go really fast and walked about 10 minutes to the starting line, enough time to get in line for the johns, which was about a mile long. Every one was trying to use the same row before the race, with runners walking by with tales of shorter lines if we were willing to sacrifice our spots in line. I saw later that the race had tweeted locations of other johns around 7:30 that morning. With as little time as we had and our close proximity to the start, most of us opted to stay in line. 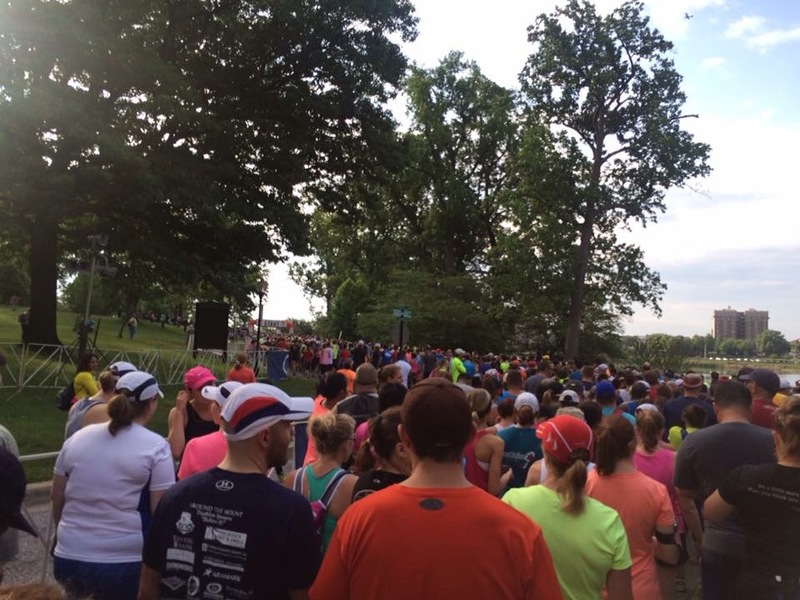 There were still dozens of people in line behind me when I headed to the starting line at 7:35. I’ve never been that late to a race before, so I had to form rank with the 2 and 3 hour runners. I don’t recommend cutting it that close. Can’t see the start line from here! Weather for this race started out at what felt like a cool 64 degrees, but humidity was in the 90% range. It was cool at start, but it quickly warmed up on the course. I splashed water on myself several times and realized that the shock value of being that hot and getting ice cold water on your face might pose a cardiac risk. My face was SUPER hot the whole time, even at such a balmy temperature. The mugginess won, and I realized that running without my water bottle would have been stuuuuuuupid. So, I knew to expect hills for this race as well as a challenging course in general. “It’s not like running through Kansas,” was a direct quote from the race website depicting the elevation. Being from the Great Plains myself, I can attest that they are not flat: the land rolls and so do the streets of Baltimore. I started out mile one a little fast, but slowed down quickly with the bottleneck. I also reminded myself that I was running with the people who intended to finish in almost double the time that I was planning to, so I spent a lot of energy bobbing through walk groups and 3-across joggers. Slowing down and speeding up, trying not to step on heels. Another reason why it’s not a good idea to show up late: you expend a lot of energy catching up with the runners who are more at your pace level. Luckily, the first mile was a steady gradual downhill, so I let gravity do some work here while I navigated and tried to break free of the slower runners. I was also completely giddy when my Garmin matched up almost perfectly in sync with the race mileage signs– that literally almost never happens. Much of the race in between miles 2 and 6 sort of just flew by for me because I was trying to focus on the moment, trying to imagine myself running the Baltimore Marathon, paying attention to what was going on around me. Baltimore has been in the news recently, and if you’ve been living under a rock and don’t know what’s going on, stop reading my blog now and go find out! Some people asked me before the race if it was safe to run there with everything having gone on, and the truth was, I couldn’t have felt in better company. 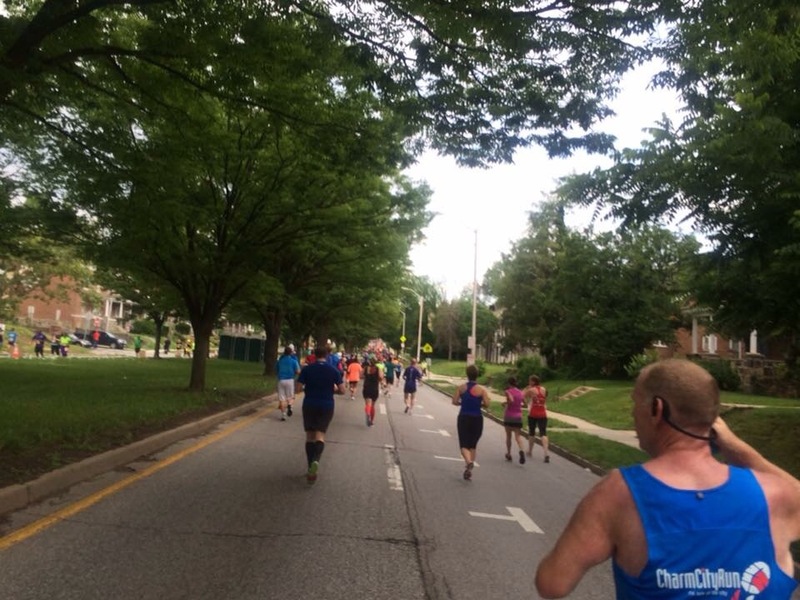 I admit that I don’t know the city very well, but the course wound through some of Baltimore’s neighborhoods and on many street corners, there were people cheering for us. People waved from their porches at us and lots of people, myself included, waved back. Police officers were thanked constantly for keeping streets blocked off from traffic. I saw a sign that said “Justice 4 Freddy Gray.” Several people stood with American flags, some ran with them, the local TV station was covering the race, so many runners in Maryland flag garb. I felt a lot of Baltimore pride in that race. I don’t want to sugarcoat things or make something huge of soething that might not be that big of a deal in the grand scheme. All I am saying is that I really got a feel for Baltimore’s unity, pride, and spirit just from running alongside people with whom I shared the same goal of running 10 miles and taking in the encouragement of those who came out and supported us. By mile 6, I was starting to break down a little bit. I felt really tired. I’d been pushing into the high 8:00 pace, which partially had me thrilled but also totally freaked me out. Right after you circle Lake Montebello, the course purposely takes you down one street with a gradual downhill only to insist you run back up when you cross the street and go back the other side. 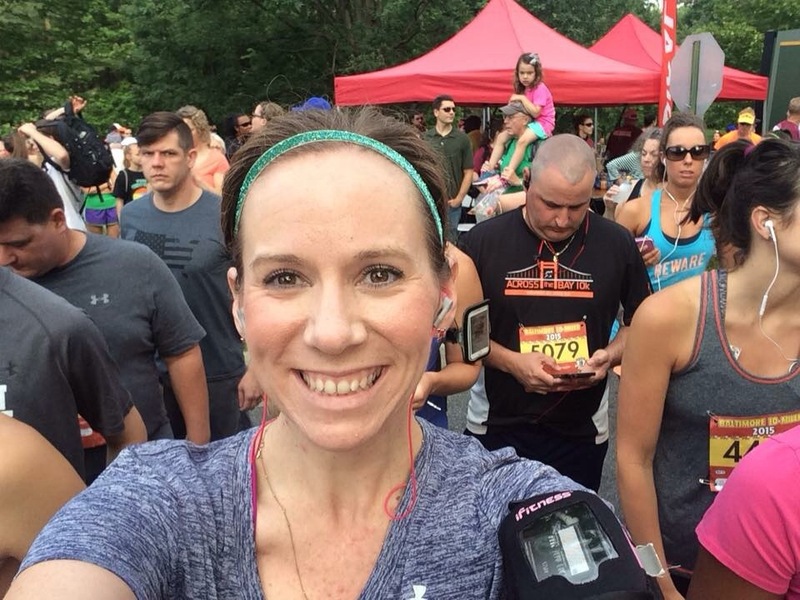 I felt determined to run all of the hills in this race– I was much more mentally prepared to run hills than I was for the Virginia Wine Country Half-Marathon when I wasn’t really expecting to have so many to run. While pretty much the whole front half of the race is either downhill or flat with some minor uphills, the back half has several up-and-overs until you get back to Druid Hill Park. Think about how much it hurts to run uphill after you’ve been running hills for the past 8-9 miles. Kinda hurts. But all of that race was nothing– and I mean NOTHING– compared to the dreaded 9th mile. The latter quarter mile of mile 8, you pretty much have no choice but to run it because it’s huge. Not just a big steep hill. It’s a good half to three-quarters of a mile of UP– this hill went on from mile 8.5 through mile 9.25. So if you walk the whole thing, you’ll kill your time, and it doesn’t do you any favors for the final mile of this particular course. The last mile of the Baltimore 10-Miler is hell. I walked for maybe a minute at the start of the mile 8-9 hill when I looked up ahead of me and realized there was a lot of hill ahead of me, and that there is no other strategy here. Time to just pick up one foot and put it in front of the other at a faster pace than a trudge. I recommend finding a good power song on your iPod and zoning out. If you expect it’s going to hurt, it somehow doesn’t. Mile 9 is at the top of that hill and, for some reason, I was thinking it was going to be cake. But seriously, look at that course elevation chart. Once you scale the 8.5-9.25 hill, it just continues to rise. And the race organizers threw in a cruel mind trick, too: as you are running up, the finish line is so close you can hear the announcers and the course loops around so you’re pretty much seeing runners looping the whole time and you’re running uphill after having just scaled a mountain at the end of a 9-mile hilly course. You know you are close to finishing, but you can’t see the finish line and you can see other runners looping so you don’t know who is about to cross the finish line and who isn’t. You’re just running uphill. And it’s the last mile– it’s the one that counts. No one wants to get to the last mile and quit right before the finish line. At least I didn’t want to. But I was breathless with my quad aching and my mind playing tricks on me when I’d look at my Garmin and see I had a quarter mile to go and the finish line was nowhere to be seen. If it were any other part of the course at that point, I might have walked. But I couldn’t now. You really, really need a good song on your iPod or an emotional/mental boost in this mile. I think the one thing that got me through that mile and all the physical and mental challenges of pushing through that mile was asking myself why I wanted a PR with this race and hearing myself say, “Because I’m tired of not being better than I used to be.” I like to think that I’ve grown somehow in my running and, the fact that I came so close to beating personal records that are 2 and 3 years old with my half-marathons this year but I still didn’t break them was distressing to me. Sometimes, you get sick of trying. But I didn’t want to get sick of trying. I wanted it to happen. So, I held on. Fought the urge to walk. Just kept moving. And I got my PR: 1:34:28. The 2012 Cherry Blossom 10-Mile record had fallen. Just like that. That hill was tough. But I’m tougher. The most fun part about the post-race festival was high-fiving Blue the Crab immediately after finishing, grabbing a slice of juicy watermelon, and snagging a selfie with the Dunkin Donuts coffee cup mascot. The finish line area was a total crush though. Not enough volunteers, and it just made me realize how essential volunteers are to race events. It took awhile to move through the lines for food, but just like the Frederick Running Festival, the post-run snack options were pretty great: chips, bananas, apples, Gatorade energy chews, protein bar, and Gu Energy Chomps as well as bottled water and Gatorade. I tried to thank every volunteer I encountered– they could barely keep up with all of us! Ice cold watermelon at the finish line! Volunteer police officer soaking cold towels for us runners. The post-race festival itself was slightly chaotic as well. Race premiums were doled out at the end, but the line was far in the back and I had to ask another runner and direct other runners who asked me where to pick them up. In addition, for those of us who entered the King Crab Challenge and were eligible for medals, the medal tent was hard to find and not many people knew why some runners had medals and others didn’t. But it worked out fine– I got a spot in the grass to stretch and eat and throw on my amazingly warm and super awesome race premium because my race shirt was soaked and the wind was making me shiver violently. I visited the merchandise tent and picked up a race shirt and magnet, made the rounds to some vendors including Naked, Johns Hopkins occupational and physical therapy, and the Dunkin Donuts truck for iced tea. I left the race shortly thereafter to get back to DC, sitting in line to get out of the park for almost an hour, but in good spirits nonetheless. I totally recommend this race. Corrigan Sports delivered on a great race once again, although I did notice that there was no course photography. So, if that’s super important to you, this race might not be for you. But you’d be missing out. The challenging course really does epitomize “pain is temporary.” I know the race was tough and, as I sit here on Monday evening writing this and my quads still feel stiff, I’ve kind of already forgotten how tough it was. I just remember what I felt running it and it was that I couldn’t give up. Also, the race premium lives up to its solid reputation. It’s awesome. If I were you, I’d mark your calendars with this race for next year. 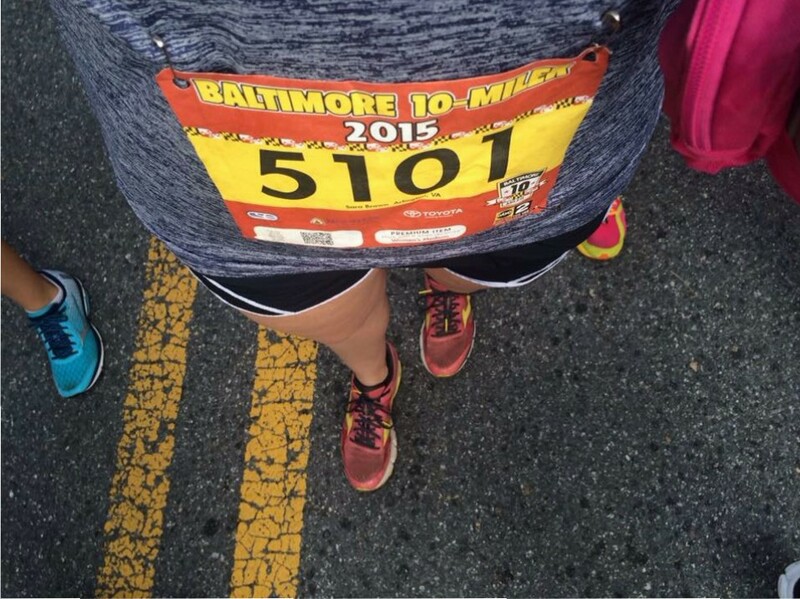 I already can’t wait for the Baltimore Marathon if the 10-Miler was this great! Great recap – I think this race will be on my schedule for next year! Previous Previous post: Off the Beaten Path: I Miss the Sun….